This sale includes a shipping, carry case manufactured specifically for the RCA 44 Microphone. You can see how the case is molded in the interior for the microphone to fit head first into the case. Also included in this sale is a new replica of the 44 microphone zipper, dust cover. Also included is an exact replica of the RCA 91-A desk microphone stand which is pictured on the microphone for sale on the left. We have provided a sketch of the wiring which indicates the jumpers to change the 44 BX from Music to Voice. 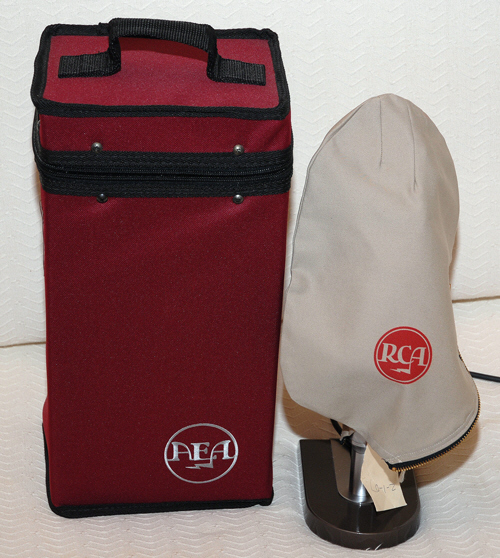 The price for our exceptional 44 BX RCA ribbon microphones includes the microphone, table stand, dust cover, a shipping and carrying case as pictured, a blank microphone flag, and a copy of the RCA 44 BX Microphone Manuel. If you have any questions, please email the American Pioneer Broadcasters at Mutual@mutualbroadcastingsystem.us. APB is offering 44BX microphones and a number of RCA 77 DX microphones, an Altec 639, and two classic Neumann U 67 tube microphones. All microphones are in pristine condition and in working order. The picture below shows the the carrying case and the RCA dust cover. The Dust Cover is NOT on the microphone that is for sale. It is only modeled on a microphone. Continue by clicking on the picture to the left.